First measure from the middle of your chest, underneath the remaining breast where the bra band sits, to the center of your spine (diagram A). Now measure from the middle of your chest to the center of your spine, but this time over the fullest part of your remaining breast (diagram B). Measurement equals 14½ inches. 14½ x 2 = 29 Band size is 29 inches. 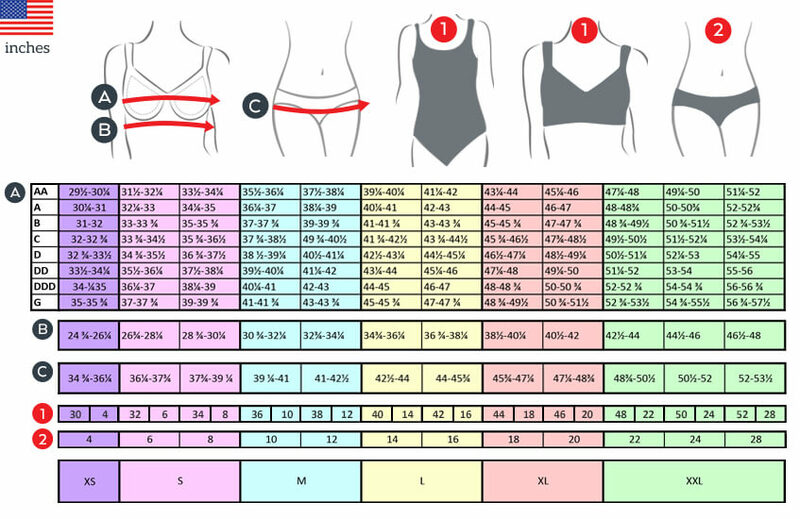 Use the chart below to find your correct bra size. Remember this is only a guide. For a perfect fit, size up or down as needed. To ensure the best fit possible, most of our swimsuits and bikinis are available in different cup sizes. Most styles are available in either a B or C cup fitting, with a smaller selection available in A and D fittings. You would choose a size based on your dress size, and your typical bra cup size.